Protesters gather at Wisconsin's state capitol. (CNN) -Protests in two states have brought familiar Democratic faces back into the fold this week. Former Gov. Ted Strickland called on Democratic supporters Saturday to join protests at the Ohio statehouse, one day after former Sen. Russ Feingold joined protesters at the Wisconsin capitol in Madison. What both states have in common are defiant responses to legislative measures that would limit collective bargaining rights for state workers. Strickland sent an e-mail to supporters on Saturday, urging them to protest Ohio Senate Bill 5, a proposal sponsored by state Sen. Shannon Jones that would eliminate collective bargaining rights for state workers. Stating a need to "defeat Senate Bill 5 and the rest of our opponents' anti-middle class agenda," Strickland asked supporters to protest because "this fight isn't just about police, firefighters, teachers and other public employees … it's about whether or not we will be a state that stands up for the middle class." The former Ohio governor, who lost his re-election campaign to John Kasich last fall, also attended protests at the Ohio capitol last week. Meanwhile, Republican Gov. Scott Walker of Wisconsin proposed legislation in his state to eliminate the right of unions to have dues deducted from the paychecks of their members and require collective bargaining units to conduct annual votes to maintain certification, a process criticized as being costly. The budget-slashing bill would also require state workers to cover more of their health care premiums and pension contributions. The proposed measures have drawn ire from state workers and have attracted crowds of protesters to the Wisconsin capitol, who were joined by Feingold on Friday. 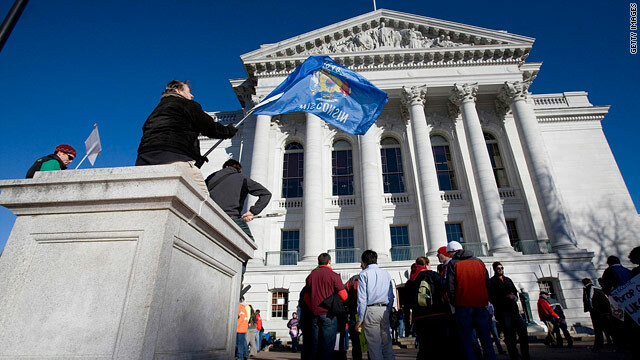 Support for Wisconsinites has also spread to the west coast, with a rallying cry from Danny Thompson, a representative of the AFL-CIO, who encouraged members to attend rallies in Carson City and Las Vegas in the coming week. "It has never been more important than now to stand in solidarity with Wisconsin workers and workers around the country – including Nevada workers - who are under attack from politicians bent on destroying the labor movement," Thompson wrote in an e-mail. "Show your support for worker's rights, and express your outrage at the attacks being leveled against them." There are bad elements to every organization, whether its government, management and even unions. As much as unions have done good for workers rights, it's been overshadowed by too many cases where they have been force to protect members whose actions clearly didn't represent anything remotely consider fair. Now the pendulum is swinging the other way where we are against unions just because their unions. Fair minded people can reach solutions to problems. But in most cases, there is the wrong leadership both in government and union management. Democrats are plain stupid. What's worse is they think Onamsa is smart enough to be President. My gosh Pelosi could do better than him and she is a plain bonifide swamp witch. It is time to impeach the Melon Head. Now he wants to destroy over 1 millions of the best weapon ever made. The M1 Carbine that won WWII and served in the Korean War. Has anybody taken notice that, it is not a person holding up a the process in WI, but a policy in place to the keep the 2 party system in power. What if an independent, a libertarian, heck even a member of the communist party was elected to the state congress for Wisconsin. Would a vote be held if that person was not present. The two parties are the same just serving different masters. Say what you want, but the little guy doesn't pay to get either party elected. Big (insert your special interest here), pays to get people elected. The little guy is just along for the ride. Republicans campaigned on a platform of smaller government, less government interference, and more freedom for the people. How does the government creating a bill that would destroy the people's right to collectively bargain fit in? Looks like the far Right GOP and tea partiers are getting a nasty taste of their own like they did to the Democrats during the health care debate. What these politicians don't seem to remember is WHY unions were formed in the first place. Please have the politicians pick up a history book and READ then get back to us all in the real world. Government workers shouldn't even have unions. The Governor of Wisconsin should order them back to work and fire them if they refuse. I already miss Gov Strickland! Kasich is going to destroy our already hobbling state of Ohio. hey Russ Feingold, we voted you out, so please stay out!! For once the Democrats are showing some backbone! Protests from the middle class are the only way to put an end to plutocracy. Voices are louder than bribes. Only when programs benefit the working class and poor is it worthy to be mutilated. I was one of the 70,000 protesting in Madison and when I sat down a teabugger asked me if I was a "Greedy teacher?" I responded with "NO! Why do you ask?" "No response!" I said that $ wasn't the issue as we have agreed to the paying of benefits (OH, I'm just a retired teacher who these cut don't affect yet????) The mans response was that we should have accepted the deal when it was on the table! Are all you teabuggers, how do I say it politely, that STUPID AND INGONORANT!" It was never put on the table, there was never any talk, it was decreed! I can't wait till Tuesday when you will hear how you will be affected by this right wing nut! Since teaching is to educate I hope that with all his big cuts coming taht the WIAA Sports programs, will be stopped. Then see who is protesting!